Come on careta, come on! 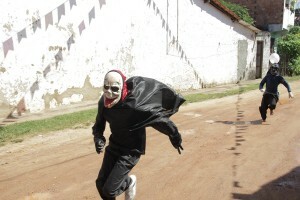 Those who walk down the streets of Acupe (in the state of Bahia) on Sundays in July can’t avoid meeting the traditional “rubber Careta (or grimmace).” There are countless people, both children and adults, dressed in frightening masks and outfits and hitting those who provoke them. They appear when you least expect, you turn a corner and here comes a group of them, walking towards you with a deep, penetrative glare. The whole community is a stage for fear, for scares, and the courage of facing this fear on these July Sundays. The game goes like this: the “caretas” walk around armed with their little sticks trying to attack those who provoke them. 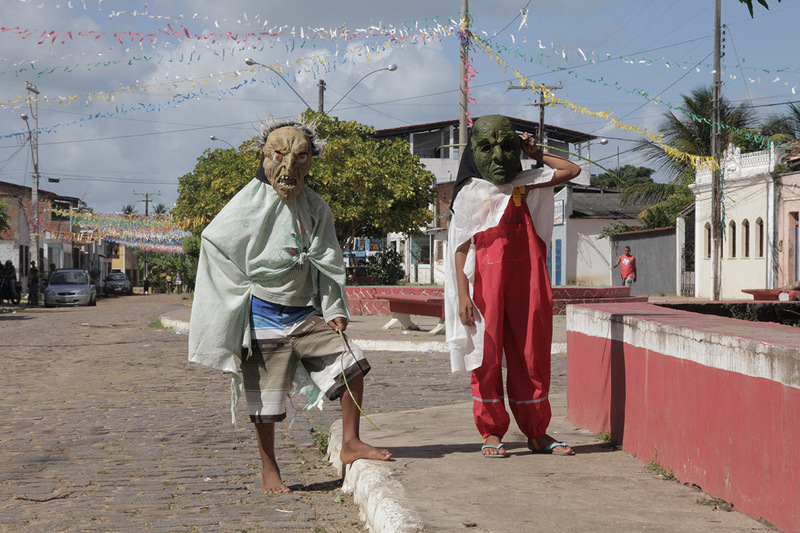 They walk around anonymously, covered in costumes that make them unrecognizable, waiting for a brave soul to tease them, to challenge them, and then… A game of dares takes place. “Come on careta, come on!” This is the cue for the careta to run in incredibly fast sprints after these instigators, who take off to hide in a house or simply run until the careta tires and gives up the chase. Once they admit giving up, the agitator is free; he eases his body and can even get a hug from the careta, a sign that it is all a game. A real experience of being hunter or hunted, the monster or the daring warrior, of living the fear and suspense of being caught or having the chance of hitting your instigators. “You are not disguising yourself when you put on a mask, quite the opposite, you are presenting yourself, we are showing who we actually are. The mask is just a pretext because, in truth, is we who are there, our wishes and desires, it is you right there, everything you feel, you give yourself to it, laying out everything you have within, and offering what you have inside to others,” he says. It’s a chance for children to live out their own fears in doses they can control. Each one decides what they want to be, and if they want to enter the game or not. 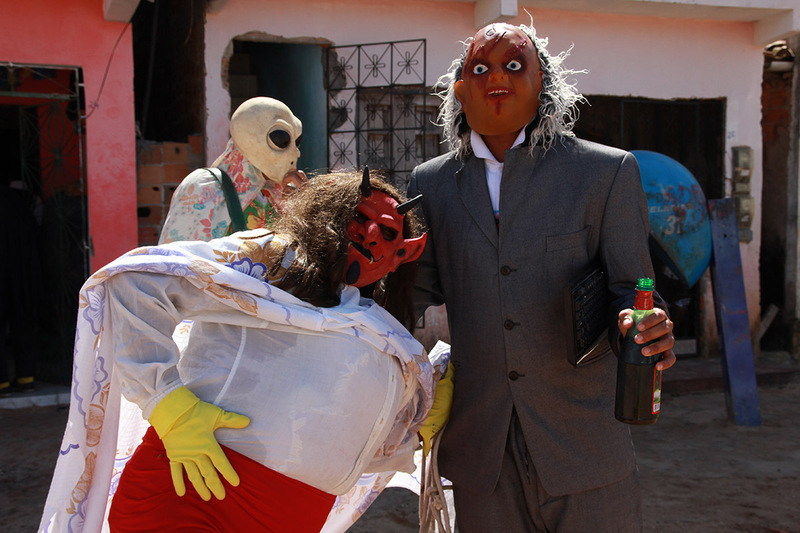 Some like to dress up as careta while others prefer to run from them, they can switch roles from Sunday to Sunday, or there are days they simply don’t want to participate in any of it, they are free to choose. But the opportunity to live and face fear is for everyone. In order to become a careta you have to rent one of these industrialized masks a few days ahead, after all, there aren’t enough masks in town for so many boys and girls. For the cost of R$4.00 (about $1.50) you can use the mask for half a day. 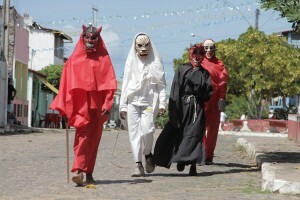 You also need clothes in addition to the masks, preferably red, black or white, and enough so they cover the entire body, without leaving any trace of who is under the costume. Jacket, pants, socks, gloves and cape are part of the attire. They use what’s available, especially to make the cape. We’ve seen capes made of table cloths, old curtains, fabric taken from umbrellas, foam fabric, or whatever else is at hand. The whole outfit can also be rented, which results in adaptations to the customer’s body, such as rope belts tied around the waist, sleeves longer than the arms, and long table cloths dragging along the ground; what matters is being inside it and completely covered. The basic rule of the caretas is to remain unrecognizable, so not even speaking is allowed since someone could recognize your voice. They stay silent for hours, only scaring others with their crooked gait or by showing their scary face and their little whipping sticks. Behind the masks it’s possible to do things you wouldn’t have the courage to do in other moments. There are, for example, countless scenes of caretas approaching pretty girls, playing a flirtatious game without, however, revealing who they are. But there is no vandalism or people leaving the game hurt. The violence is only as big as the satire, the challenge and the courage of each one. “The caretas used to be made of cardboard, there weren’t these rubber ones, bu,t due to complaints from people about the excessive violence that was happening, some people decided they should go out in blocks, without hitting or running after people. So it became a block with a band that followed it, with the group only simulating running and scaring people. 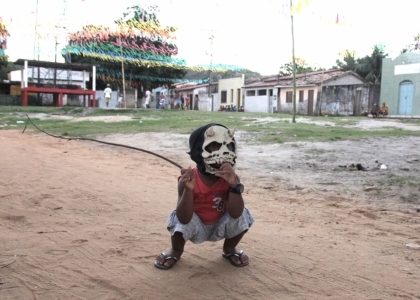 Then, since there was no longer anyone that made the paper masks to go out on the street, as a form of resistance, they began using these industrialized masks,” Monilson tells us. 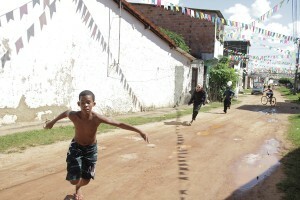 During this time the children weren’t allowed to play, there were only adult caretas and only during Sunday afternoons. The children began to go out in the mornings as caretas because in the afternoon they were terrified of the adult ones and weren’t capable of facing them. 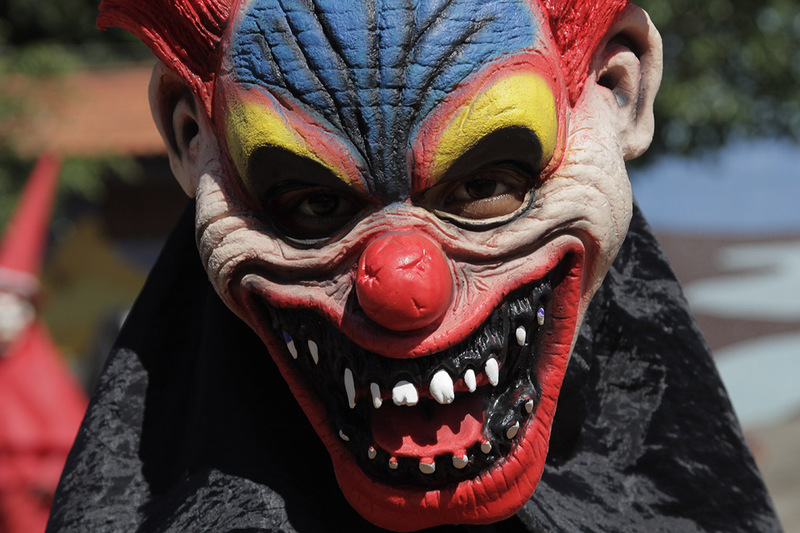 Adults invest a lot more into creating costumes and characters that are both funny and scary. There are adult caretas that look pregnant, enormous gorillas, and some carry rods with real dead bats and rats on the end. On the other hand, the children play the role in the essence of fear, without much extra investment. The majority of the population of Acupe supports this manifestation. 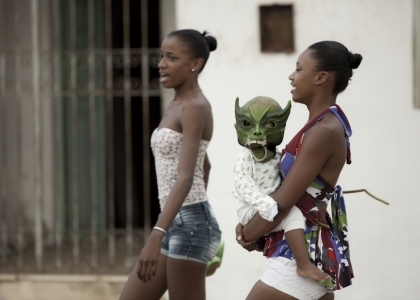 “It’s a game for kids to have fun, there’s nothing wrong in what they do,” says Érica’s mother, on of the girls we followed from the moment she dressed up as a careta to when she chased after her instigators. But there are also those who disapprove. We witnessed parents coming out the doors or windows of their houses waving sticks and threatening anyone that came after their children. 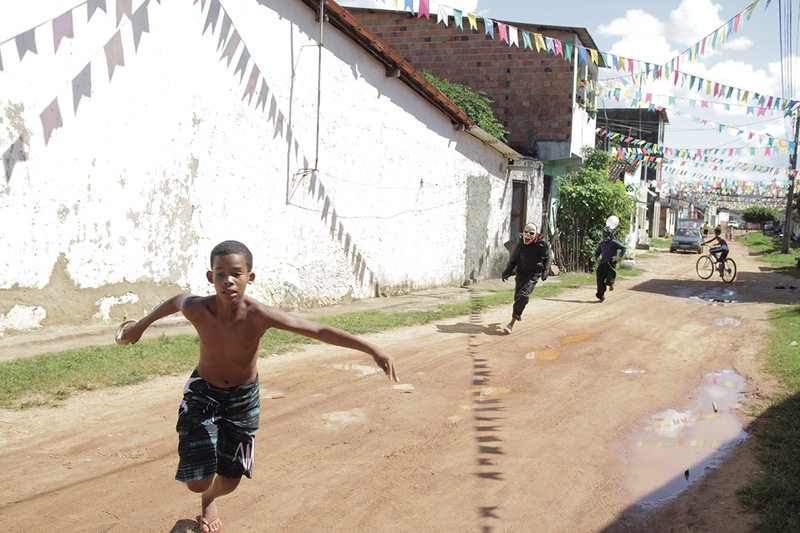 “Come here and I’ll get you for real, come!” one father yelled while running after a careta. However, we also heard that the same people who complain that the caretas are too violent also wonder when they will come out. One way or another, the caretas resist time, culture, and all the nuances of modern life. A story that is still embodied by the people of Acupe. “This feeds the identity of this community, it shows who they are. You won’t hear in the discourse of people here any references to the plight of black slaves, their struggle in the plantations, etc. 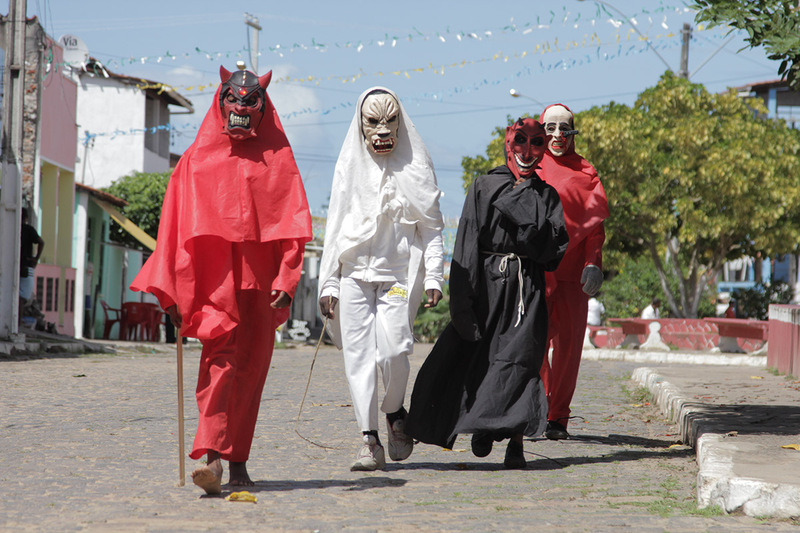 This discourse is over and has been embodied, it exists in the Sundays in July, in the drums of the terreiro (Afro-Brazilian ceremonial grounds),” explains Monilson.